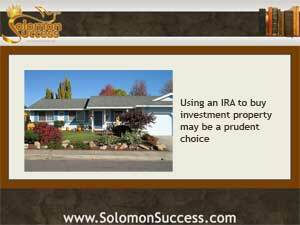 Solomon Success > Blog > Tapping IRAs to Fund Investments: A Prudent Choice? “Old age is a crown of dignity, when it is found in the ways of justice,” says King Solomon in Proverbs 16:31 – one of his many proverbs about reaping the rewards of a wise and careful life. But many Americans nearing retirement age haven’t saved enough to retire and enjoy the rewards of that well-lived life. For some, using retirement accounts such as an IRA for investing can be a prudent course – but one that’s not without pitfalls. As Jason Hartman says, income property is the best bet for long-term returns and creating wealth by putting retirement funds into buying real estate can be a smart choice. But some caveats apply – and new inventors taking this option must weigh the drawbacks and benefits before jumping in.